Fibatuf MAX is a heavy duty industrial sheet for extreme conditions or where longevity is required without the concern of strength reduction. It is a well known fact that thermoplastics like Polycarbonate and PVC become brittle over time, however with the engineered composite of Fibatuf MAX, this is no longer a concern. 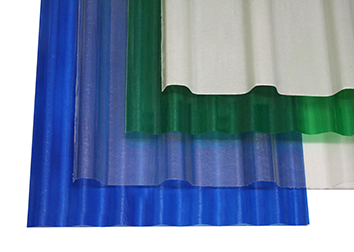 Fibatuf MAXimum is the strongest Translucent sheet on the market. Using Engineered E Glass and modified Acrylic Epoxy composite. Conforms to the most advanced Australian specification AS/NCS 4256 parts 1 & 3. From impact strength, tensile and flexural modulus. High fibre reinforced for extra strength. Breakage will not occur as a result of hailstones measuring up to 15mm in diameter for a period of 2 years. 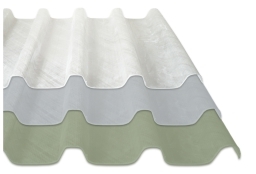 A co-extruded fibreglass sheet with a composite fibre reinforcement, a dual extruded sheet for UV resistance. Lets the light in while keeping the heat out for maximum comfort. 5 year guarantee against yellowing and loss of light transmission. Resistant to harsh chemicals and materials, including serveral mineral and organic acids, oxidising agents and many others.. Suitable for use in high wind areas, perfect for South African weather. Fibatuf profiles available ex-stock from Duroplastics are IBR.